Morris and Gwendolyn Cafritz, Washington, D.C. (by 1962). The Morris and Gwendolyn Cafritz Foundation, Washington, D.C. (gift from the above); sale, Christie's, New York, 9 May 2000, lot 507. J. Dupin, Miró, New York, 1962, p. 554, no. 708 (illustrated, p. 411; dated 21 January 1948). J. Dupin and A. Lelong-Mainaud, Joan Miró, Catalogue raisonné. Paintings, 1942-1955, Paris, 2001, vol. III, p. 117, no. 809 (illustrated in color). J. Dupin, Miró, Paris, 2012, pp. 277 and 441. Museum Kunst Palast Düsseldorf, Joan Miró: Snail Woman Flower Star, July-October 2002, pp. 196 and 236, no. 45 (illustrated in color, p. 197). Basel, Fondation Beyeler and Washington, D.C., The Phillips Collection, Calder, Miró, May 2004-January 2005, p. 255, no. 141 (illustrated in color, p. 244). Saint-Paul de Vence, Fondation Maeght, Barcelone, 1947-2007, July-November 2007, p. 136 (illustrated in color). Baden-Baden, Museum Frieder Burda, Miró: die Farben der Poesie, July-November 2010, p. 214, no. 36 (illustrated in color, p. 147). The title is certainly far more evocative than the matter-of-fact Peinture Miró often applied to new paintings, and more enticingly elaborate than the descriptive but still generic Femmes, oiseaux, étoiles, or variants of the same, he bestowed on many others. Just as Miró inscribed the reverse of the present painting, this strikingly lyrical title should be cited in full at the outset--Le serpent à coquelicots traînant sur un champ de violettes peuplé par des lézards en deuil--but for the convenience of brevity in this text, hereafter as Le serpent à coquelicots. This is one in a group of paintings, comprising "one large mural and fourteen medium-sized canvases," as Jacques Dupin enumerated them (his catalogue nos. 807-812 and 814-824), which Miró completed between late 1947 and the spring of the following year. "They show great variety, along with bearing poetic titles." Regarding the latter aspect, Dupin singled out the present work--"Here, for instance is the longest and most florid: Snake with Poppies Moving on a Field of Violets Peopled with Lizards in Mourning" (op. cit., 2012, p. 277). These are the first compositions that Miró completed upon his return from a momentous journey, his first trip to and an extended stay in America, which lasted from his arrival by plane in New York on 8 February to his departure by ocean liner eight months later on 15 October 1947. Do not seek, however, in Le serpent à coquelicots, or other pictures of this period, pictorial evidence of the artist as occasional traveler and tourist; Miró's experience of America was far more profoundly personal and manifest itself in the very essence and strength of his new work. We find here the production of an artist newly invigorated with the knowledge that following the self-imposed obscurity of the wartime period he spent in Spain, during which Miró largely worked in seclusion to evade attention from the Franco regime, he suddenly witnessed gratifying signs that he was experiencing a growing international reputation, especially in America, which would soon extend throughout Europe as well. Pierre Matisse, Miró's tireless advocate and dealer in America, had planned an exhibition for the artist in his New York gallery during May-June 1947. Matisse had moreover concluded an agreement by which Miró accepted a commission to paint a large mural for the Gourmet Room of the newly completed Terrace Plaza Hotel in Cincinnati, designed by the prestigious firm of Skidmore, Owings & Merrill, leaders in the new post-war international style, who have since done many of the tallest buildings in the USA, including the Sears Tower in Chicago and, most recently, the new One World Trade Center in Lower Manhattan. Miró already had one monumental work to his credit, Le Faucheur (The Reaper: Catalan Peasant in Revolt) (Dupin, no. 556), which he painted for the Spanish Pavilion at the 1937 Paris World's Fair, where Picasso's Guernica was also on view. The mural's component sections were subsequently lost without a trace while en route for safekeeping in Valencia during the Spanish Civil War. It was Miró's authorship of this pro-Republican peasant mural that gave him cause to fear retribution from the new fascist government in Spain when he and his family took refuge in Palma Mallorca while fleeing the German invasion of France in 1940, and even after they cautiously returned to his native Catalunya in 1942. Following the end of the war, Miró was eager to visit America, and he optimistically anticipated the impact that New York would have on him. In making plans for his 1947 exhibition, he wrote Pierre Matisse on 3 September 1946, "In the future world, America, full of dynamism and vitality, will play a primary role. It follows that, at the time of my exhibition, I should be in New York to make direct contact with your country; besides, my work will benefit from the shock" (quoted in C. Lanchner, Joan Miró, exh. cat., The Museum of Modern Art, New York, 1993, p. 337). The time was indeed propitious for Miró to make his presence known firsthand. His work had been introduced to New York when he participated in the 1926 International Exhibition of Modern Art held at the Brooklyn Museum, and because Pierre Matisse had been showing Miró regularly in his 57th street gallery since 1932, his painting was perhaps more widely appreciated in artistic circles in America than it was during that time in Europe. James Johnson Sweeney, the director of The Museum of Modern Art, New York, had long been an admirer, and gave the artist his first retrospective in November 1941-January 1942. Although the Japanese bombing of Pearl Harbor in December dampened the public's interest in this exhibition, American painters and critics had taken notice. Indeed, if Miró had received favorable attention in New York at the beginning of the war, he propitiously refreshed his reputation there near war's end. The exhibition of sixteen of the twenty-two gouaches in his Constellations series (Dupin, nos. 629 and 643; figs. 1 and 2) at the Pierre Matisse Gallery in January 1945 was the first major show of recent work by a leading European avant-garde painter held in New York since America entered the war. "The opinion was unanimous and the public has found your exhibition very moving," Matisse reported to Miró. "You have attained an unprecedented degree of poetic intensity, and in color as in the line a dazzling mastery" (quoted in ibid.). Soon after Miró's arrival in New York, together with his wife Pilar and their daughter Dolores, he traveled to Cincinnati to examine the site of the restaurant at the Terrace Plaza Hotel, and upon his return to New York, began work on his mural. Miró executed this large canvas, his first major international public commission, in the studio of painter Carl Holty on East 119th Street. During this period he made prints in Stanley William Hayter's Atelier 17 on East 8th Street, where he was introduced to Jackson Pollock. "We could not do more than smile at each other," Miró later recalled, "since we had no common language" (quoted in B. Rose, Miró in America, exh. cat., The Museum of Fine Arts, Houston, 1982, p. 35). He made frequent visits to his old friend Alexander Calder in Roxbury, Connecticut, reunited with fellow surrealists Yves Tanguy and Max Ernst, as well as the painter Amédée Ozenfant, and met often with Marcel Duchamp. New York did not disappoint Miró. "The intense rhythm of the city, the youth and vitality of the people, the gigantic dimensions of the buildings, the vast distances, and unfamiliar proportions," Dupin has written, "the difference in scale and measure between American reality and the norms of old Europe--struck Miró like 'a blow to the solar plexus,' to use his own expression" (op. cit., 2012, p. 276). Francis Lee, in an interview for the magazine Possibilities, asked Miró if he thought America would influence him. "Yes, very much so," replied the artist. "Especially as force and vitality. To me the real skyscrapers express force as do the pyramids of Egypt." He went on to declare his newly acquired passion for baseball--"especially the night games"--and ice hockey. "And I adore your swing music," he added (quoted in M. Rowell, ed., Joan Miró: Selected Writings and Interviews, Boston, 1986, pp. 202 and 204). The Pierre Matisse Gallery exhibition of Miró's work, on view 13 May-7 June 1947, was a timely event, and affirmed the artist's growing prestige on the post-war American art scene. "The first representative showing anywhere outside Spain of the work Joan Miró has done since 1939 (at Pierre Matisse's) is an event whose importance to the American art world cannot be overestimated," Clement Greenberg declared in his review of the exhibition, published in The Nation, 7 June 1947. "Miró is the only painter to have emerged since 1925--that is, after Matisse, Picasso, Klee and Kandinsky--whose art has extended the limits of Western painting in a way at all comparable to theirs... And it is indeed impermissible that any new painting which transcends the merely pleasing and advances the frontiers of modern art should fail to deal with Miró any more than Matisse and Picasso. It is significant that Miró's influence is prominent, along with Picasso's, in the formation of Jackson Pollock's art; and Pollock is the most important painter since Miró himself" (J. O'Brian, ed., Clement Greenberg: The Collected Essays and Criticism, Chicago, 1986, vol. 2, pp. 153-154). Miró completed the Cincinnati mural (Dupin, no. 817; fig. 3) by the end of September. "It made a strong impression," he wrote to his friend the architect Josep Lluis Sert on 14 October, on the eve of his departure from New York, also mentioning that it would be exhibited early the next year (March-April 1948, as later scheduled) at The Museum of Modern Art, before being shipped to its destination at the Terrace Plaza Hotel. Indeed, by the time the mural was placed on public view, Miró, back in Barcelona, had nearly completed his new series of paintings with the poetic titles, including Le serpent à coquelicots. "First, the suggestion, usually from the material; second, the conscious organization of these forms; and third, the compositional enrichment. Forms take reality for me as I work. In other words, rather than setting out to paint something, I begin painting and as I paint the picture begins to assert itself, or suggest itself under my brush. The form becomes a sign for a woman or a bird as I work. Even a few casual wipes of my brush in cleaning it may suggest the beginning of a picture. The second stage, however, is carefully calculated. The first stage is free, unconscious; but after that the picture is controlled throughout, in keeping with that desire for disciplined work I have felt from the beginning... We Catalans believe you must always plant your feet firmly on the ground if you want to be able to jump up in the air" (reprinted in M. Rowell, ed., op. cit, p. 211). Miró's approach to painting Le serpent à coquelicots followed this procedure. The artist began the composition by washing on freely brushed and spattered beige and earthen tones to suggest the champs de violettes. As Miró frequently did in his wartime and early post-war compositions, he deliberately stressed the surface of his support--"Once the paint is dry sandpaper it lightly and rub it with pumice stone," he instructed himself in his Working Notes 1941-42. The next step was to "organize" the picture--"work with a sharp incisive line as though it were an engraving...do it as spontaneously as possible... Keep working on it, always controlling the medium" (ibid., pp. 185 and 187). In the present painting these linear elements are the outlines of the snake and four figures, as well as the drooping flower that clings to the large rectangular plaque-like head of the tall central figure. The addition of the star at upper left signifies that this gathering of signs is taking place in a preternaturally cosmic dimension. The final "enrichment" phase commenced as Miró applied opaque pigments to give body to the figures, and added the accents of brilliant color that animate the composition. The overall effect in Le serpent à coquelicots is a visually succinct and harmonious balance of varied and dynamically interacting pictorial forms, which lends the composition both its lively, spontaneous character and a classically poised and serenely timeless air. The paintings of the immediate post-war period--especially those done in the wake of the Cincinnati mural--represent a significant consolidation of imagery and technical means (Dupin, nos. 834, 836, 857, 873 and 834; figs. 5 through 9), the most significant development in his painting since the completion of the Constellations. The present painting's archly surrealist title is actually a useful guide to what is occurring here, among these mysterious creatures, on whom Miró has typically bestowed grotesquely anthropomorphic features. Drawing on myth and the ritualistic mysteries of primitive prehistoric societies, as evidenced in extant cave paintings--and in no small measure taken from the writings of Freud as well--Miró shows them gathering around a larger-than-life totemic figure, perhaps representing a primal ancestor, their chief protector and the guardian of values related to their social affinities and well-being. Miró has lifted these primitive personae from the deepest levels of the human subconscious and made them emblematic of our social origins. This imagery is steeped in the enchantment of our pagan past: violets are in the iconography of antiquity the symbol of humility, the lily-like flower that surmounts the great plaque-like rectangular head signifies purity, while the red poppies that the snake wears like eyes on its visage were in ancient times an attribute of gods associated with sleep, dreams and the night. In the pagan lore of antiquity the serpent is hardly the devious agent of evil-doing which we have learned to despise from Biblical narratives. Instead this winding creature represents the even more ancient and beneficent qualities of fertility and wisdom. In its ability to shed its skin, the snake betokens rebirth and healing. The imagery in Miró's Le serpent à coquelicots--a veritable celebration of the power and potential inherent in pictorial sign and symbol, both serious and delightful by turns--is festively life-affirming in the sagaciously enlightening manner one should expect from a supreme artist, who has elected to treat as his themes the most profound and ineffable mysteries deeply embedded within the human psyche. It was, in fact, Miró's ability to create and effectively employ a strongly communicative personal idiom in the form of primordial signs, arising from a deeply animistic spirit, that was one of the reasons why his friend Picasso praised his paintings, as far back as in 1924: "After me, you are the one opening a new door" (quoted in M. Rowell, ed., op. cit., p. 102). This component in Miró's work strongly appealed to a new generation of American painters, who were seeking an authentic and vital means of transforming the moribund conventions of figuration into a more essential expression of subjective creativity, which they believed could only proceed along various intuitively oriented paths to abstraction. Miró's fundamentally poetic impulse provided a promising alternative to the strictly formal ideas, derived from Cubism and De Stijl, which had fostered a prevailing taste for geometric abstraction during the 1930s, an approach subsequently deemed superficial and empty, and incapable of further development. Barbara Rose has written, "Miró's dictum, quoted by Sweeney in his [1941 MoMA retrospective] catalogue, that 'painting or poetry is made as we make love, a total embrace, prudence thrown to the wind, nothing held back,' provided a rationale for the intense abandon and total emotional involvement demanded by the group that included personalities as troubled and desperate as Pollock [fig. 10], Gorky [fig. 11] and Rothko. They, like virtually every ambitious New York School artist, were profoundly affected, to an extent that altered the course of their art, by the 1941 Miró retrospective" (op. cit., exh. cat., 1982, pp. 19-20). Miró's 1947 sojourn in America broadened the extent and impact of his influence in America, which would endure into the next decade, as Abstract Expressionism entered its heyday. Miró, for his part, came away enriched as well. "The artist's visit to the United States thus marked an important date in his life," Dupin explained. "It was there he found confirmation of the importance of his work and evidence of the widespread interest it aroused... Above all, he discovered that the primitive magic of his art was consonant with the most dynamic of modern societies" (op. cit., 2012, p. 277). Joan Miró in New York, 1947. Photograph © Arnold Newman. (fig. 2) Joan Miró, Constellation: Vers l'arc-en-ciel, 11 March 1941. The Jacques and Natasha Gelman Collection, The Metropolitan Museum of Art, New York. (fig. 4) Joan Miró, Femme et fillette devant le soleil, 30 November-19 December 1946. The Hirshhorn Museum and Sculpture Garden, Smithsonian Institution, Washington, D.C.
(fig. 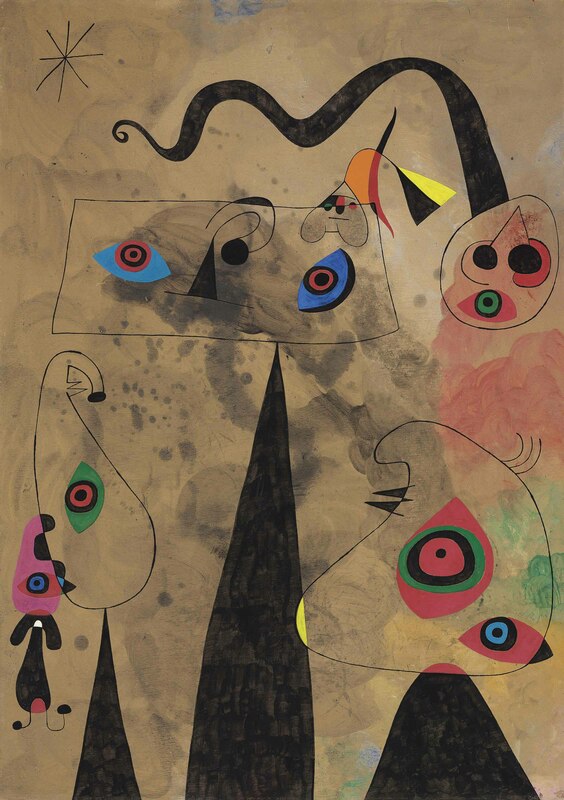 5) Joan Miró, Peinture (Femmes, oiseau dans le clair de lune), 1949. Tate Modern, London. (fig. 6) Joan Miró, Peinture (Femme, oiseaux, étoile), 1949. Jacques and Natasha Gelman Collection, The Metropolitan Museum of Art, New York. (fig. 7) Joan Miró, Peinture, 1949. Museo Nacional Centro de Arte Reina Sofía, Madrid. (fig. 8) Joan Miró, Peinture (Personnages dans le nuit), 1950. The Rita and Taft Schreiber Collection, The Museum of Contemporary Art, Los Angeles. (fig. 9) Joan Miró, Peinture, 1950. The Museum of Modern Art, New York. Conor Jordan, Deputy Chairman, Impressionist & Modern Art, discusses Joan Miró’s Le serpent à coquelicots traînant sur un champ de violettes peuplé par des lézards en deuil, to be offered in the upcoming Impressionist and Modern Art Evening Sale on May 6.